The MT5+ offers high definition security that meets the standards of the 21st century. 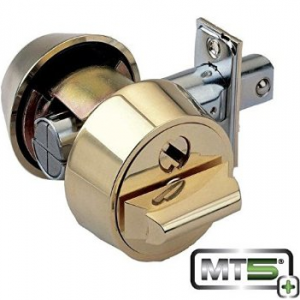 Featuring new highly qualified features, the MT5+ has originated from many years of experience and expertise resulting in many successful features.To explain the MT5+ in brief words it is a triple locking, top tier mechanism with a high security platform. The MT5+ is increased in providing key control by making use of patented keys and involving the use of a magnetized key order card for key duplication by a distinct card swipe key cutting machine. 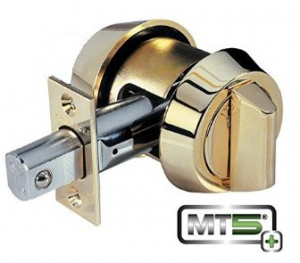 Picking, bumping, drilling and other varieties of lock manipulation can be provided from MT5+. The technology of the MT5+ is based upon decades of alteration, constant improvement and the understanding of the needs of security that customers deal with worldwide. 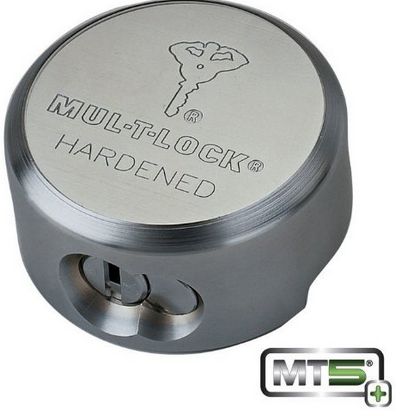 MT5+ is manufactured to remain undamaged under various lock manipulation techniques such as picking, bumping and drilling with the help of Mul-T-Locks trademark quality. The MT5+ is also designed with three independent locking components for triple the strength for protection. The keys can only be copied by swiping a magnetized key order card though a programmed key cutting machine. Keying possibilities include unlimited keying proportions, which make MT5+ the best choice for any application, no matter what size. MT5+ keys are designed with unique groove cuts on the side to position with the cylinders top locking bar, telescopic cuts, and a clear cut, flexible Alpha Spring to operate the rear pin. The double-sided, horizontal keys offer more durability and advantage of having keys that operate upside down or right side up and in two different locations without master keying.